Do you want to charge up your city? The following are some thoughts for charging up your community's excitement level, charging up your electrical devices, and charging up your economy. The Denver Post June 24, 2012 article, “Getting a charge out of new law,” described a new state law effective in August. This law will allow anyone to sell electricity. One potential application is for electrical charging stations spread throughout the city. The law is aimed at charging electric vehicles, but the charging stations could be used to charge any electrical device. Consider for example, a charging station at a park. The same station could be used to charge an electric vehicle as well as a laptop, cell phone, or tablet. For the owner of the charging station, this could be an additional source of income, be it the government entity that owns the park or a business owner with some unused rooftop space for solar panels. The electric vehicle owners will have convenient, reasonably priced electricity to reduce "range anxiety" concerns. Refill costs may be “$4 instead of $40 or more for a tank of gas.” With the reduced emissions from the electric vehicles, everyone will benefit from the cleaner air. This could be a win-win for all stakeholders. As much potential as the reselling of the electricity holds, this is only the tip of the iceberg, so to speak. The big impact could come from combining the charging stations with low speed vehicles (LSVs). 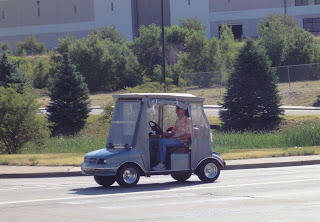 Of the many types of vehicles permitted on the road today in Colorado, low speed vehicles could be an up and coming mode of transportation. LSVs include neighborhood electric vehicles and golf cars (golf carts with head lights and brake lights). LSVs are already permitted on roads with a speed limit of 35 mph or less and can cross roads with a higher speed limit at intersections. For car drivers, the LSVs are significantly lower cost. For senior drivers, they are also safer to operate. Thus, LSVs can provide mobility options for later in life. The real potential of LSVs is the fact that the vehicles are one forth the size of traditional gas powered motor vehicles. Thus, if there were enough users of LSVs, the city could restripe a few parking lots and get a 4 fold increase in parking. Or, some of the space could be reclaimed for non-parking uses. For example, consider the economic impact of this reclaimed land used for additional outdoor seating at a restaurant. Developers could use this extra space for a larger building footprint, which may translate to more sales tax revenue or property tax revenue. 1) Promote the use of LSV noting the benefits such as lower cost, safer, lower emissions, smaller size, and more non-parking space for developers/landowners. 2) Make sure that all zoning and ordinances allow for the charging stations and solar panel installation. 3) Make sure that parking requirements are properly adjusted for LSVs. 4) Create a connectivity map of the city noting key destinations such as stores, parks, schools, and residences and roads with speed limits <= 35 mph. If the key destinations are not connected, see if there is an easy way to add the missing connectivity such as changing a speed limit from 45 to 35 mph. 5) Determine how to best reallocate the reclaimed land to benefit the city and its residents.